Each of our outdoor, children's playhouses are designed and built to order. 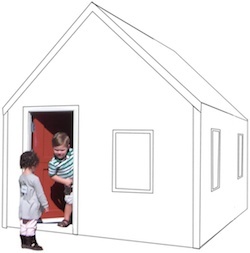 This means that we can accomodate your requests in ways you could never expect from a company that mass produces playhouses in standard shapes, sizes and colors. 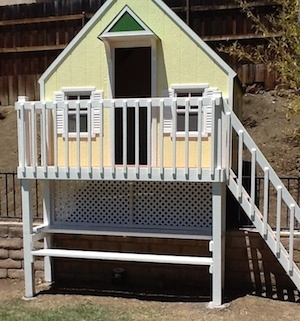 We have occasionally received requests for playhouses with other dimensions and configurations. This could be because of space constraints in our customer's yard, or simply a desire to create something unique. 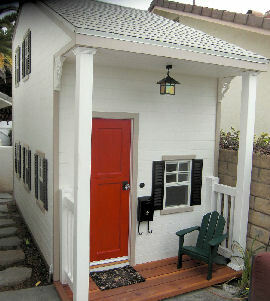 For example, one customer wanted to build a large wooden playhouse but only had a narrow space available. We were able to accomodate their needs by building this narrow, yet spacious 6'W x 11'D x 11'H playhouse with a loft space and a porch. Here's another interesting example. 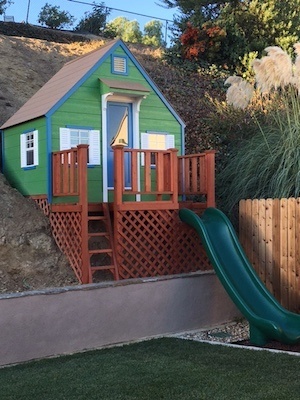 A customer wanted to build a playhouse in a very unusual location. 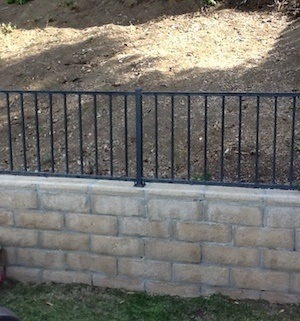 The small space was on a narrow, fenced-in hillside. We designed a playhouse on a raised platform that straddled the fence and provided a level surface for the playhouse. Here is yet another example of a challenging project. In order to construct a playhouse with height and a slide with the following parameters: no use of a freshly installed lawn and a steep hillside. We carved out an 8' x 8' area, installed a wall to hold back the hill, drove 9 posts and built an 8' x 8' deck to support the playhouse. Select a color scheme to compliment your home, or just choose the colors that make you and your child happy. You can also choose from a variety of features, including lofts, balconies, porches, and electric lighting. 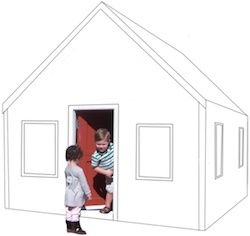 You can even design your playhouse completely from scratch. Involve your kids in the process so they can really feel a sense of ownership and pride. When you buy your children a Folk Art Playhouse you are giving them a very special gift. Forget about Barbie's Dream House. Create the playhouse of your child's dreams. We'll help you design it, and then we'll build it for you.